I’m happy to share that the news that the new Smashburger location in Durham’s Lakeview Pavilion is providing Triangle Explorer readers a chance to win two FREE dinner entrees. To enter simply leave a comment on this post sharing your favorite burger topping or milkshake flavor. 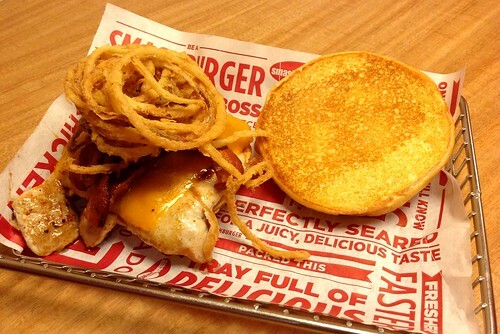 You can also enter by sharing this post on twitter using the hashtag #ExploreSmashburger or by sharing it on facebook. The winner will be randomly chosen next Friday May 30th at noon and notified via email. You can read my full review of the from back in March here. mushrooms + swiss. Simple. Epic. Bacon is obviously the best topping to a cheeseburger. Fried green tomatoes on a burger are just divine. Peanut butter – on burger or in shake! I’m WIIIIIILD! I pretty much like all milkshakes, but cookies & cream is probably one of my favorites. I love banana shakes and love onions on my burgers! Avocado, tomato, and cheese on the burger. All milkshakes are delicious! When I’m splurging, I love a fried egg on my cheeseburger. Milkshake favorite is: cookies and cream. I have my in-laws here visiting. For today, we had a day planned in Durham (Duke Homestead, Duke campus, Durham). 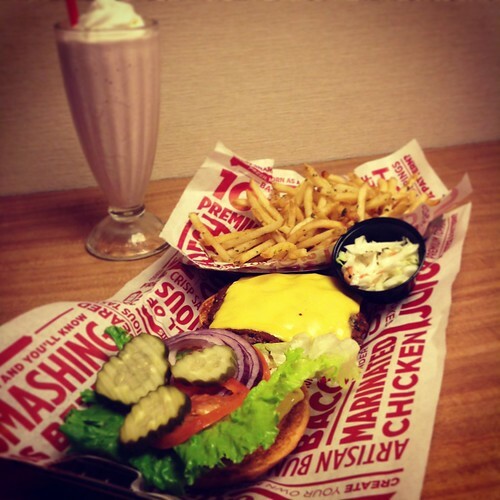 But I didn’t know where to take them for lunch … and saw your Smashburger entry yesterday. It sounded delicious. So I took them there today: BBQ Cheese & Bacon with regular fries, Bacon Cheeseburger with regular fries and Classic Smash with Smashfries and a Caramel Milkshake with Butterfinger!! All burgers were fantastic. But I am a basics girl. I looooooved the Classic Smash the best. Give me a burger with cheese, lettuce, tomato and onions and I am happy. – Thanks for the awesome tip at exactly the right time!!! My favorite burger topping is guacamole, and I Iove a good chocolate shake! My favorite milkshake flavor is Oreo. My favorite burger topping is definitely avocado / guacamole! Over easy egg, slightly runny, and bacon. Definitely bacon. Avocado as the topping. A peanut butter, caramel, banana milk shake is the bomb diggity. Pimento cheese on a burger – yum! Fried eggs and pimento cheese on my burger please! Crispy bacon, pickles, and mayo for me! I love good runny melted cheese and bacon paired with cookies and cream shake. onion straws for the burger are a delicious addition & PB + chocolate make a great combo for a milkshake! Pickles, onions & mustard thats it!!!! A runny egg is the best topping. If you can beat a great orange creamsicle shake, I’ll give you a dollar.